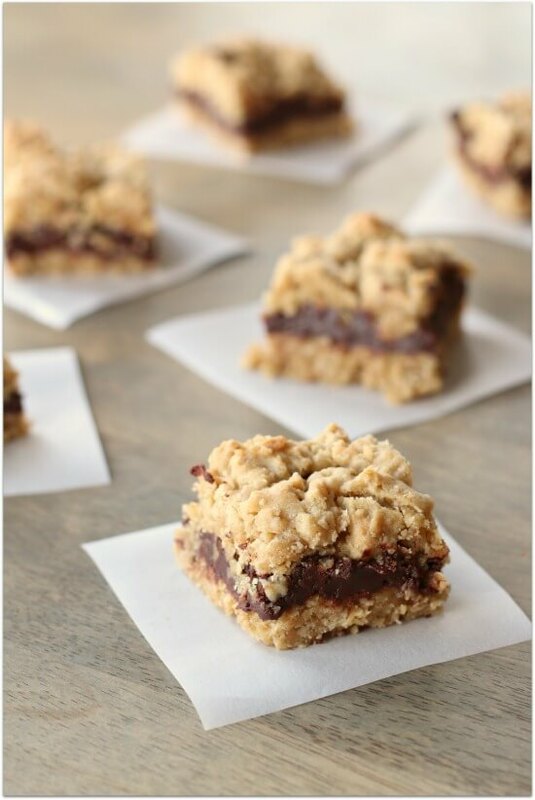 This Fudgy Wudgy recipe is iconic in my family. It has been around for 25 years and has been a staple for potlucks, Sunday desserts, “I’m bored” desserts and “I don’t want to risk trying a new recipe when I know this one is the best” desserts. a. I always have the ingredients to make them in my pantry. b. I love the dough. The dough it so good. Basically it’s oatmeal cookie dough but then you also make this melted fudge chocolate mixture and when you eat a little bit of the cookie dough dipped in the chocolate it’s so amazing. c. They taste good straight out of the oven but they also taste amazing 24 hours after you make them. When they first come out of the oven they are ooey gooey and we serve them in a bowl with a spoon and top them with a scoop of vanilla ice cream. After they set up they look like the pictures above. 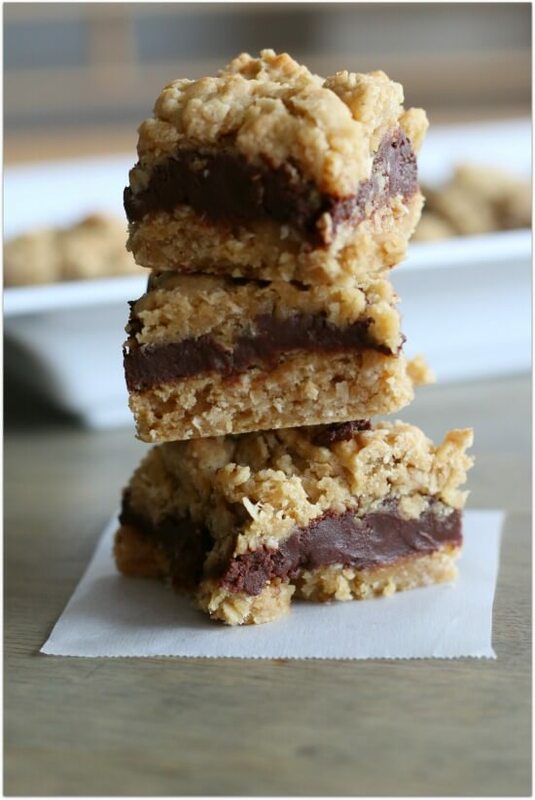 The fudge in the middle has solidified and they are more like a cookie bar. Both ways are delicious. My husband prefers them right out of the oven. I prefer them set. d. They are hard to mess up. Unlike regular cookies that can go flat these are just stuck in a pan and put in the oven. The biggest deal is making sure you don’t overbake them. But I will walk you through it, don’t worry. e. Everybody likes them. Period. They aren’t hard to make. Just whip up some oatmeal cookie dough. Melt some chocolate in the microwave. Then you will press 2/3 of the dough in a pan and spread the chocolate on top and then drop the remaining cookie dough on the top. Bake it for 20 minutes and you’re set! Maybe these will become a favorite in your family as well? I hope so. I’ve had so many great memories surrounding this dessert. I love how food can do that! Make the fudgy middle: Preheat the oven to 350 F. In a microwave safe bowl, melt chocolate chips, milk, butter and sugar together in the microwave for one minute. Stir and if needed cook for another minute. Add vanilla and stir. Set aside. Make the oatmeal cookie dough: Cream butter and sugar in a stand mixer until fluffy (I like to mix for about 2 minutes until it is really fluffy and changes texture and color). Beat in the eggs until well mixed. Add in the vanilla. Gradually add in the flour, baking soda and salt. Lastly stir in the oats. 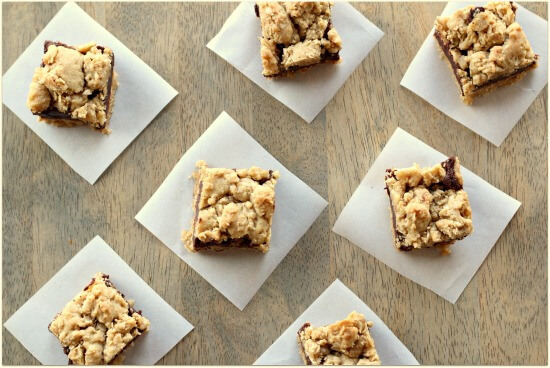 Assemble the cookie bars: Grease a 9 x 13 pan or line with parchment paper. Spread 2/3 of oatmeal cookie mixture in bottom of pan. Pat down. Use hands that have a little water on them so that the dough doesn’t stick. 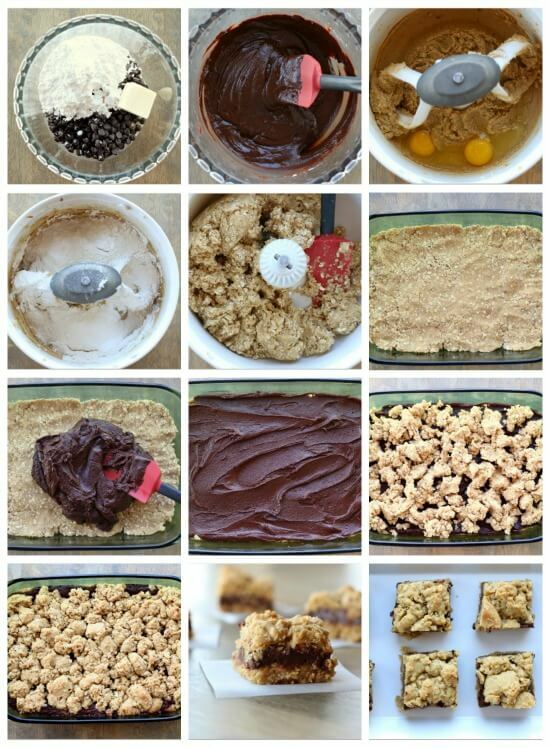 Top with the chocolate mixture and spread evenly over the dough. 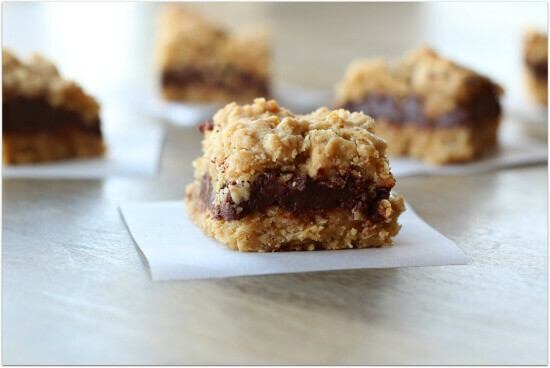 Drop remaining oatmeal mixture in little chunks all over the top of the chocolate. It won’t cover it completely but it should be well distributed. Bake for about 20-25 minutes until the top is just starting to get a little brown…don’t overbake. 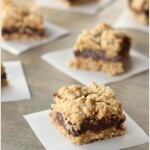 Eat cookie bars hot or cold. Fudgy Wudgies are amazing!! Thank you for this and so many other great recipes! I made a double batch for a family gathering, and had some leftovers. Do they freeze well? The chocolate middle is extremely sweet and alittle unnecessary. I am not one to watch my sugar, but I thought these were just ok due to this. Took to a friend’s home and could tell these weren’t everyone’s favorite… sorry. Did you use milk chocolate chips? what’s the difference between Quick Oats and Instant oats? Hi Lydia, they are the same. What fun to learn that this came from Kay Dell Nelson’s Senior Sampler class and see her comments here. My kids loved her and that class! I also enjoyed getting to know her in an adult cooking class and keep in touch yet from my home in Great Falls. Great memories! This is so fun!! Yay for senior sampler at Great Falls High! love these, when i got the recipe from a friend, she called them Chocolate Orgasms. I love your name..a little more apropos if bringing to a company bake sale fundraiser! I love cookies and this is the best cookie I have ever eaten!!! These are delicious. I’m not a great cook and an even worse baker but whipped these up with no problem. Thanks for a great recipe. I made this for the ladies group at church tonight. Awesome!!! This is definitely one to keep and make again. Pleases me beyond words…to hear Nicole mentioning “our class” in her blog!! … And, indeed, Mr. Hatler who provided the recipe! We had a good thing going, didn’t we? !…back then! I learned SO much from these wonderful senior kids! … What a joy they will always be in my life!…and Nicole will always be a special treasure to me!! Oh this is so fun that you commented! I will tell Nicole. Thank you for giving us the best recipe of our life!!! It has literally made appearances at hundreds of potlucks and dinners. I have lots of old fashioned oats. Couldn’t I just blend them up a bit? Would they work Ok in the Fudgy Wudgies then? Thanks for sharing great recipes. Joyce, I am not sure about that. I bet pulsing them in the blender would work but I can’t say for sure. I hope it works for you! Karen, I have made these several times this past year and have used whatever oats I have, usually old fashioned. I did not even blend them up and the Fudgy Wudgies came out wonderful still. Thank you for a great recipe! Again! Wow I’ve never tried old fashioned before! Maybe I’ll try a mix next time. Karen, I have never had a fudgie wudgie, but now I don't want to go one day without them! They look incredible! I need to make these for my next family gathering! I would probably eat them all while they are still warm! I'd make these in a heartbeat except I don't have a stand mixer anymore. The pictorial is bliss on its own! I don't either, but my Kitchen Aid hand mixer goes through everything I make! yes you can totally use a hand mixer! Awesome food recipe. Thanks for sharing.